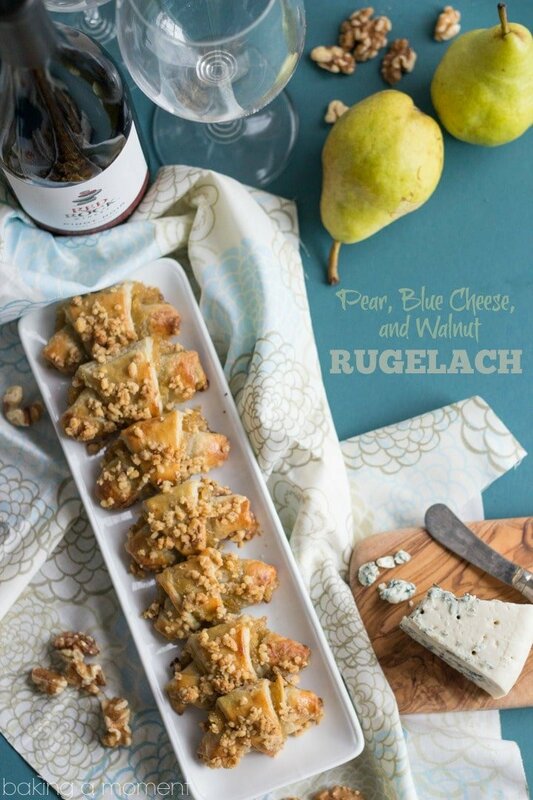 These Sweet and Savory Rugelach make a great Cocktail Party Appetizer! 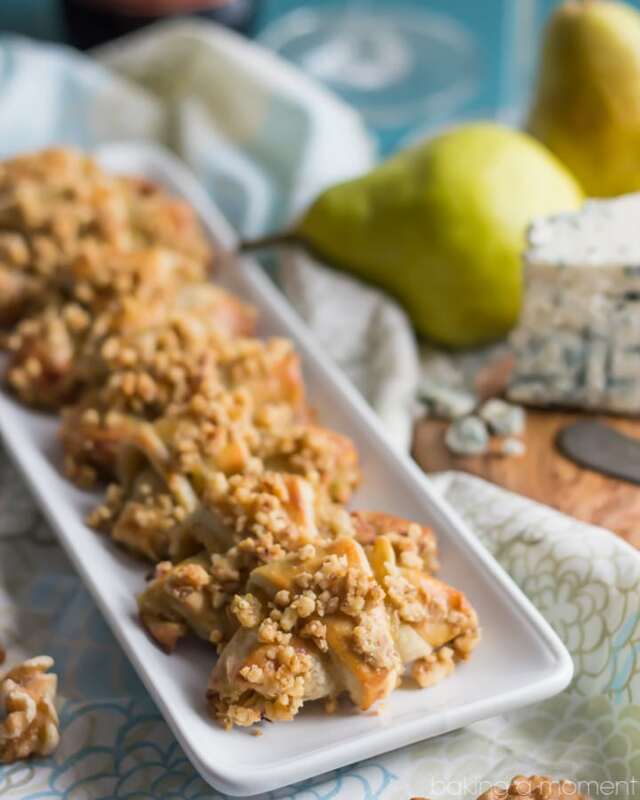 The Pastry is infused with a mild and creamy Buttermilk Blue Cheese, and it’s beautifully balanced with a seasonal Pear Filling and crunchy Walnut topping. Good morning my friends! How was your weekend? Mine was busy and very exciting. I had a great time in Chicago, learning all about Aldi, and then it was off the plane and right into the wedding festivities. It was all just beautiful and I enjoyed every second of it! If you follow me on Instagram then you’ve probably already seen some of the highlights! So here we are on Monday morning, and as exciting as it is to travel, it always feels so great to get back home and into my normal routine. I was not able to get any baking done over the weekend, but I did whip these little treats up a few weeks back and I’m so happy to be able to share them with you now. If you aren’t already familiar with rugelach, they are traditionally a sweet cookie, with a cinnamon or fruit filling. The pastry itself is super easy to work with; it’s a silky dough that’s made with cream cheese and it just melts in your mouth. When Stemilt invited me to develop a recipe that pairs fruit and cheese, I just knew that I wanted to use pears and blue cheese. 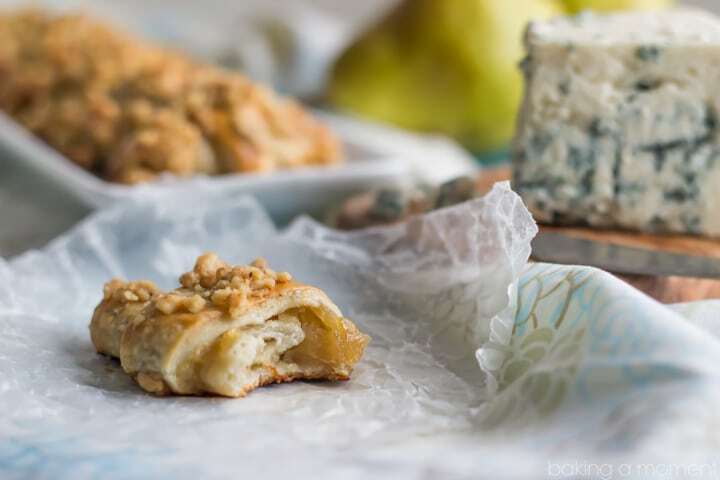 They’re such a classic combo, with the added crunch of walnuts, and rugelach are a perfect vehicle for those incredible flavors. I just swapped out a little of the cream cheese for a mild and creamy blue. One batch of this recipe will give you 4 dozen cookies, so they’re perfect for feeding a crowd! But if you’d like a smaller batch, feel free to halve the recipe. 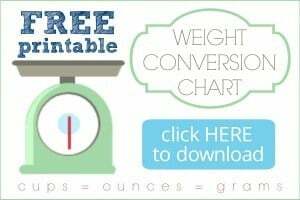 I’ve tried it myself and it works just great! As you can see here, you just roll out the dough into a big circle and then spread it with the sweet pear filling. Cut it into wedges and then roll each wedge up crescent-style. Brush with egg, sprinkle with chopped walnuts, and bake! They look fancy but really it’s pretty simple! These Sweet and Savory Rugelach make a great Cocktail Party Appetizer! 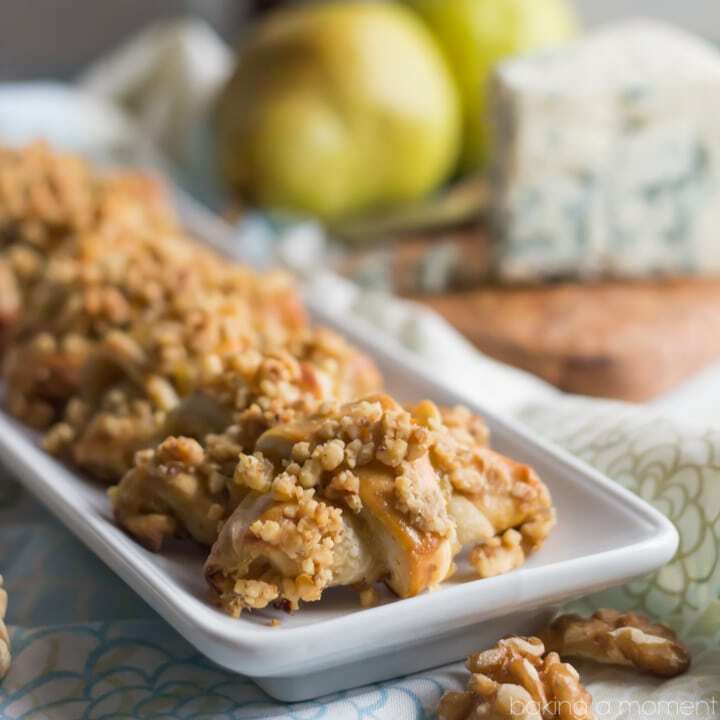 The Pastry is infused with a mild and creamy Buttermilk Blue Cheese, and it's beautifully balanced with a seasonal Pear Filling and crunchy Walnut topping. Peel and core the pears. Shred with a box grater or food processor. Heat a small skillet on medium high heat with the butter. Add the pears, brown sugar, and salt and cook until slightly softened. Drain off any excess liquid and refrigerate until chilled. Cream the butter, cheeses, and honey in a large mixing bowl until smooth. Divide the dough into 4 equal balls and refrigerate for one hour. Roll each ball to a thickness of ⅛ inch, and top with an even layer of pear filling. Cut into quarters, and then cut each quarter into thirds. Starting at the widest end of each triangle, roll gently towards the point and then shape into a crescent. Refrigerate for 30 minutes minimum. Brush the rugelach with egg wash and top with chopped walnuts. These are fantastic when warm from the oven, so if you are able to keep them unbaked in the fridge or freezer until your guests start to arrive, you should definitely give that a try. But they’re still pretty rockin’ at room temp so don’t be afraid to leave them out on a platter as the party goes on! Hope you enjoy, and if you’re looking for more great ways to pair fruit, cheese, and wine, definitely check out the Pairology tool on Stemilt’s site! That is exactly what I had in mind, Renee! Great minds think alike 😉 So glad you enjoyed sweetie; thanks for the comment! Loving this, Allie! It’s such an elegant and tasty treat. So glad you had an amazing weekend. It sounds like loads of fun! Oh ya, I had a great time! Back to reality now, lol 😉 So happy you liked the recipe Jen! Thanks for the great feedback- hope you’re having a great week dear! I think this is over the top for unique and elegant. What a spectacular appetizer! Thank you Carol! I really loved the sweet/savoriness of them, and the walnuts added a great crunch. Thank you so much for the great feedback! What a jam packed week / weekend – so much fun! This rugelach looks incredible – what a gorgeous recipe to make during the holiday season! Ahhh…rugelach! I’ve only tried chocolate and strawberry rugelach, but the pair of blue cheese and pear sounds awesome. Can’t wait to make these yummy treats. Thank you Linda! I made chocolate and pecan last year and they were fabulous. But this version is totally different yet equally delish! So happy you liked, thank you for the sweet comment! This looks wonderful…the flavors compliment each other perfectly! What a great idea…thanks for sharing! Pastry infused with blue cheese sounds like a plan to me. Great recipe! Wow Allie this looks incredible! At first I thought it was something sweet -like a caramel crumble, but on closer inspection it turned out to be better! Sounds like you had a fun weekend, travelling can make you feel like such a busy body. The stillness of getting back home can be so nice! I bet the wedding festivities were beautiful too. Oh, just gorgeous! It was a fun weekend and yes, it’s good to be back home. It’s taking me a while to get caught up though! So happy you liked this recipe, Tashiana, thank you so much for the sweet comment! This is such a great idea, Allie! I love, love, love rugelach, but have never thought to try making them savory. These sound delicious! Hope you had a wonderful time in Chicago, and maybe next time you are in town we can meet up! I would love that! My trip was super quick (less than 24 hours!) but now I’m dying to go back and spend more time. You’ll be the first to know if I’m there again! I want to try this right now!!! Amazing! They look amazing Allie! And I’ve always been a pear fan. Mmm…. Aw, thanks Melanie! It was a blast… and now I’m ridiculously behind, lol! That’s ok it was worth it! Hope you’re having a great week, my dear! Thanks Liz! So happy you like it; hope your weekend was lots of fun too! I heard Mixed was amazing! You would love rugelach! Girl you should totally do a coconut version. They’re tdf! Like a little croissant only think creamy instead of flaky. Allie, these look so tasty! The pear, blue cheese, and walnuts are such an interesting flavor combination! Thanks Lisa! I just love that combo- it’s such a classic! And so good with a glass of wine 😉 Thanks so much for stopping by and for the sweet comment! Thanks Allies, I tried this recipe, at new year party. Nothing left. This Rugelach is an absolute winner. And the flavors they are gorgeous. I’m really glad you made this great recipe.